Here at Ironmongery Experts we know everyone has different tastes, which is why we offer an increasingly expansive range of locks & latches from both an older generation as well as newer, more modern models and fixtures. We have a wide variety of mortice sashlocks for sale, so finding one to match your preferences has never been easier. Our mortice sashlocks are an innovative hybrid of the traditional mortice deadlock and the modern mortice latches, combining safety with ease of use in a stylish and practical format. 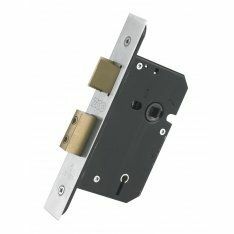 Also available is our selection of mortice bathroom locks, rebate sets and sliding door locks and latches, both alternatives to the standard lock and latch hybrid, tweaked for specific applications and door types. All of these types of locks come in an assortment of sizes to match any door necessary, and each fixture can be made out of brass or stainless steel to correspond with your aesthetic. For those searching for products of a professional capacity, we carry a large collection of digital locks as well. These advanced fixtures are regularly fitted in workplace domains, and serve to provide a secure environment accessible by a select few without the need for easily misplaced keys. On the other hand, if you’re looking for a simpler, more compact design, we have you covered there too. Our rim locks & night locks provide seamless security in a small, efficient package. Popular with new homes, these models are very easily installed and operated. If you’re in the market for affordable components and fixtures, the budget locks we stock are a fantastic alternative that boasts tensile strength and versatility. Similarly, our fire brigade locks provide the very best in heavy duty protection and are most often used in industrial settings. We also offer a vibrant selection of padlocks for outdoor and indoor use, available in nickel, brass, steel and aluminium. For the kitchen and the bedroom, we provide a varied array of magnetic catches and roller catches. These are ideal for keeping your cupboards, wardrobes and doors closed without the need for rigid locking mechanisms and are available in many assorted designs. No matter your needs, we have the lock and key.